Article 25, in partnership with the BRE Trust, is bringing together outstanding design professionals who work to support the most vulnerable in society across the developing world. These inspiring monthly panel discussions consider the pursuit of progressive, sustainable architecture which focus on the communities they serve. 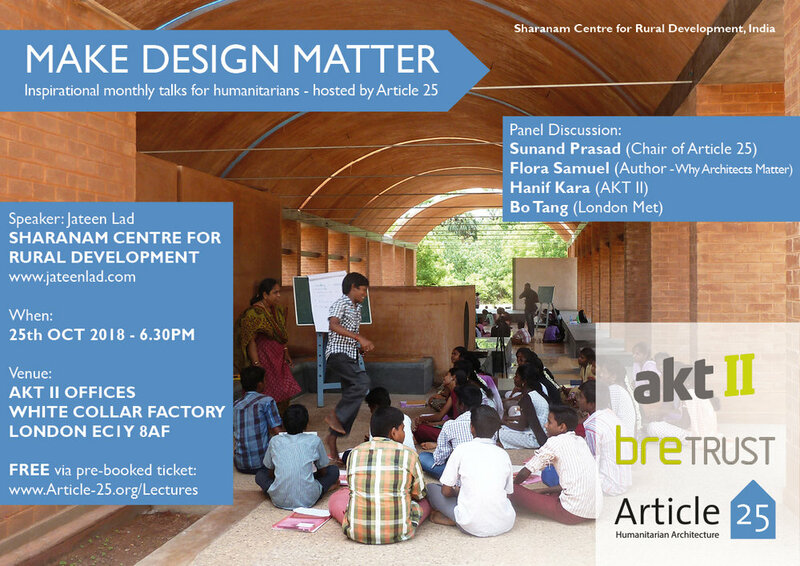 Our October talk will be delivered by Jateen Lad on a Community Centre in India, hand built by local people. Built at the edge of a rural landscape ravaged by illegal quarrying, the Sharanam Centre for Rural Development enables SARVAM, a local NGO, to expand its community-led transformation of chronically underdeveloped villages outside Pondicherry, India. In this scarred context, Jateen Lad sought to create buildings of dignity and tranquillity while addressing pressing social and environmental concerns in the process. Meaning “refuge”, Sharanam was conceived to host community programmes in education, health and poverty alleviation. The building comprises a large vaulted multi-purpose hall, offices, a newspaper studio, meeting spaces, a radio station and a sanitation block on a derelict 5-acre site healed and revived through extensive plantation and gardens. The project is constructed from the most local of resources – the red soil of the site – and is built entirely by hand with rudimentary tools. Purposefully set up without a contractor the entire construction phase was set up and led by the architect as a social development project in its own right upgrading the employable skills and long term livelihoods of over 300 local village workers who were trained on-the-job in a range of precision building skills and innovative sustainable techniques. Sharanam successfully demonstrates how architecture, when driven by human issues and ethical practices, can genuinely help facilitate the social and economic development of deprived communities where design skills are most needed.